Jenny Matlock: It didn't work! Believe me, I am counting down to the change of seasons!!!!! Wouldn't it be "cool" if our recipes would have an affect on the weather?? Looks yummy! I'm counting the days, as well! I am ready for it but the weather isn't:) Have a blessed day, HUGS! Humidity?? I always thought that's why people move to Arizona because it's dry heat with no humidity. I don't want you to be jealous but it's in the 70's here today. Wish I could send some to you. I am ready for chilly chili nights! Definitely cool here in the morning - sweater or light-jacket cool. Then it's duvet-cool at night. Fall is really on the way! Nice try! We're supposed to get up to 100 on Thursday! Jenny it is still too hot to even think about Chili....sorry it didn't work! If only! My attempt to coax the weather would have been with hot chocolate and marshmallows, but that wouldn't have worked either. Ugh! Wonderful, that food is very rich. Greetings. I will eat from your silky, tender, feminine hands any day (smile). It does look mighty gooooooood!!! hmmm. put it in the freezer and have a chili pop? Thanks for your visit! Started working on women in sports. So far, completed Runner Woman and Golf Woman. Love your idea of Golf Woman returning Golf Man's serve! 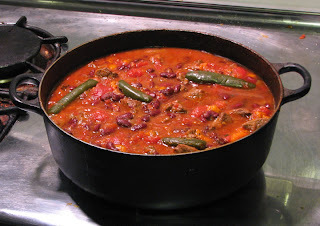 I love chili.. and it is getting closer to those warm meals days here. a few more weeks! Im dying to make a chicken pot pie! I'm looking forward to fall but not ready for summer to end quite yet either. Chili looks yummy! I can eat chili year round! Night before last, it was very dark and rainy, so I made spaghetti. I make it with Merlot, which gives it a very rich flavor. Hey! I could put it in chili as well!!! Hah,made me :) makeup melting indeed. I quite frankly have had enough of it. We love soup season. I say, bring it on. It's still in the 90's here. Unheard of in this neck of the woods..
Love chili -- but only when the weather is cold (which is like for 10 minutes here in TX) and with cornbread!! Well, it was worth a try, right? And i guess the chili backfired, didn't it? Instead of making the weather any cooler, it made your innards hotter. Cheap trick it played on you! Jenny, I can't wait for fall and lower humidity! i am so tired a sweating my brains out every day! PS: Thank you very much for the sweet card! Our move will begin a new chapter in our life and we are looking forward to it! Your Chili look delicious. I'm looking forward to cool weather so I have an excuse to make a nice hot bowl of chili. I'm in the mood for fall myself. I got chili today at the local grocery store deli for my lunch at work! First time I have bought soup there in 4 months. Oh my gosh....this didn't work?? I think you should try again next week and then please let me know. I need a little NIP in the air too!